Are Leather corals for BeginNer, Advanced, or Both? 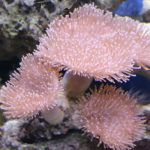 Leather corals are often some of the most eye catching corals in an established tank. Not always the brightest or flashiest coral, though some very colorful. They are typically the largest coral in a tank. As most people get into the hobby of reef keeping they buy small frags from the local fish shop (LFS) in the beginning and very few of them make it long term. For most people, the leather coral is often one they are able to keep healthy long term. Matching this longevity with their faster than most growth rate and you can quickly see why leathers are often one of the biggest corals in an established reef tank. Their hardiness and adaptability to live through swings in water condition and lighting are what make this possible. 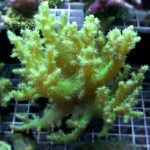 It is also why leather corals made the list for our three phase beginner coral plan. 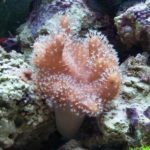 These are very good corals for anyone new to the hobby and looking for something eye catching that does not require as much constant care as others. This does not by any means indicate that experienced reefers should not keep these beautiful corals. In fact an experienced reefer who can maintain a well-balanced reef tank is very capable of growing massive show pieces. 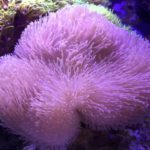 Some even able to support or at least supplement the cost of their hobby selling and trading off frags from their coral. 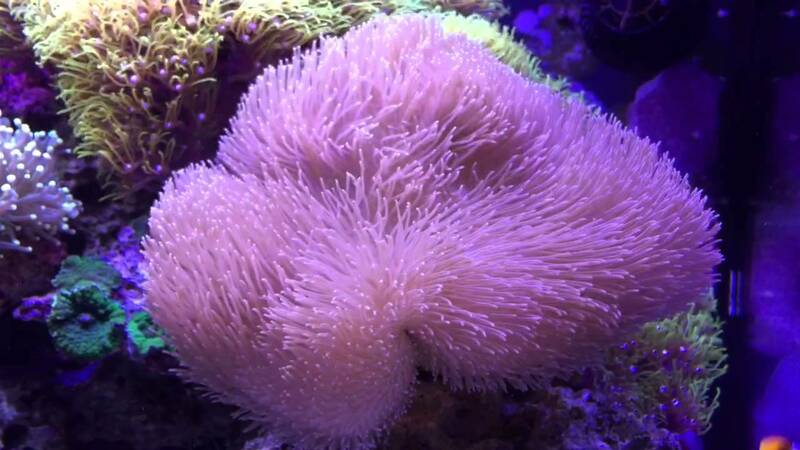 Pink Toadstool Leather Coral shared by Koko on Youtube. What is a leather coral? 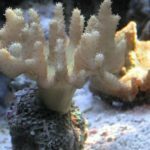 Are leather corals toxic to other corals? Leather corals are a soft coral meaning they do not calcify and build stony skeletal systems. There are the few exceptions that do calcify at their base but these are the exception, not the rule, and most likely not what you will find at your LFS. Leathers are from the biological family Alcyoniidae. This family consists of soft leathery feeling corals. They are also all classified as octocorals, meaning that their polyps all have 8 tentacles or points around the polyp. Beyond that though these corals can vary greatly. Withing the family of Alcyoniidae, there are at least 35 genera, and within those numerous species. The genera Sinularia for example has over 150 different species. This is why you will often see leathers labeled with very generic or physically descriptive common names rather than scientific ones. Very few people are able to correctly identify each one, and I am not one of those people. 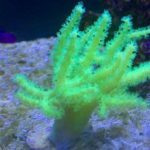 The common types of leather corals you will find online and in your LFS are the Toadstool, Devils Hand, and Finger Coral. All named as thus do to their physical characteristics. Although there are a wide range of species of leather corals, these commonly seen corals can often be classified to their genera at least if not their species. The Toadstool Leather Coral will most often be within the Sarcophyton genera. Devils Hand Leather Corals are more often than not of the Lobophytum genera. Finger Leather Coral will likely be of the Sinularia genera. Beyond this, because of visual similarities most species do not in many cases get labeled down to their species in most corners of the hobby. There are the few very unique species like the Yellow Fiji that have been given their own specified name similar to how fancy zoanthids are named. The biggest bulk of leather corals will be found with brown, dull green, grey, and muted yellow colors. There are though many variants with bright pink, deep purple, blues, and even neon green colorations. Many being very bright under actinic lights. 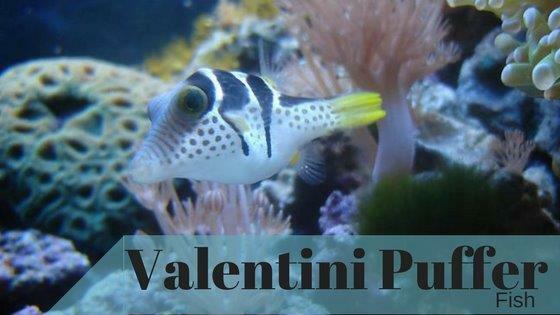 Due to the ease at which these are propagated many of the more colorful variants are commonly found in the hobby and are aquaculture which is good for our natural reefs. Unfortunately though through the years, the practice of dyeing leathers has been seen. 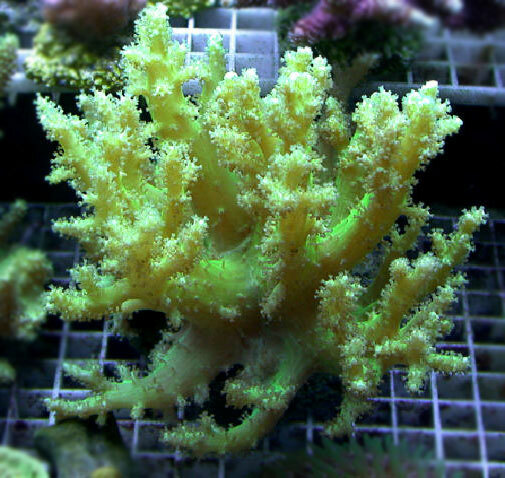 Although they will readily take the dye color and look gorgeous this is not healthy for the corals long term health. Make sure you are purchasing from a reputable seller and that the coral looks to be in good health. This will generally keep you away from a bad dye job. Although leathers are very resilient to swings in water parameters they do prefer consistent conditions. They can be kept with very low lighting par of 50 – 100 but with many species being found in shallow water lagoons and reefs they can and often will do better in low to moderate lighting of 150 – 250 par. This is because they will draw a large portion of their food about 85% from photosynthesis by their zooxanthella. These algae living within their polyps will feed on the light creating nourishment for the coral. The other 15% or more depending on lighting conditions is captured out of the water flow feeding on small micro fauna and critters as well as absorbing it directly from the water. The last main thing to consider when caring for leather corals is water flow. These corals will require a moderate to high flow. This is in part because they need to have food flowing by them to eat but also because they will periodically shed. Time lapse video of a day in the life of a toadstool leather. Timelaps of Toadstool Leather Coral shared by Whiz Kid on Youtube. Leather corals will take most of their nutrition from zooxanthella and photosynthesis. They will also feed on phytoplankton and small microscopic creatures like brine shrimp especially if housed in a very low light area. Although they do not require spot feeding like some more finicky corals but mine have always looked healthier and seemed perkier and more extended after I feed my filter feeders. I feed mine a powdered coral food like Reef Chili, Reef Roids, or Coral Frenzy. I will mix these powdered foods with Red Sea’s Reef Energy which is a 2 part nutrition formula. 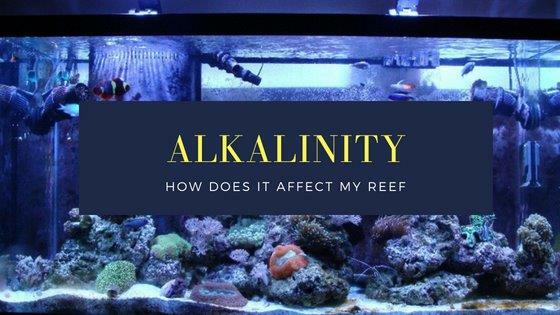 This concoction is poured into the water near a high powered pump or spot feed near the corals I want to get this the most. The good news is that this is great for not just your leathers but anything feeding grabbing food out of the water. This includes your xenia, zooanthids, acans, gorgonias, and many many other corals. Many people have seen their leather very shriveled and sucked in with their polyps completely pulled in and thought something was wrong. The coral often described as not opening or dying. They then keeping a close eye on their coral over the next few days will see it spring back to life as if nothing has happened. Often looking better than it did before. This behavior is a common characteristic of leather corals. This happens when they shed their outer mucus layer. They will shed about every month or two. This outer mucus layer is a protective coating that blocks unwanted particulates and critters from actually touching the corals skin. As things get stuck in this layer it gets dirty and to cleanse itself the coral will shed this layer generating a new protective coating. After shedding the coral will often appear to grow slightly and be more extended than prior to starting the shed. The coral relies on the water flow around it to help with this shed. The coral retracts and shrivels loosening the outer layer and letting the water current haul it away. This layer of mucus can be irritating to other corals and should, if possible, be removed from the tank. 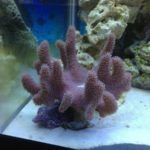 Timelaps of Toadstool Leather Coral shared by Boywithafishtank on Youtube. Do you have experience propagating leathers? Tell us about it in the comments bellow. This name can be a little eyry. They will have a single stalk with a cap similar to toadstools. The top of their cap though will have protrusions which resemble thick nubby fingers. These nubs giving them the appearance some could compare to a deformed hand and from there the name. On the cap and the protrusions are polyps of varied size depending on species. I actually have one of these in my 180g and it always seems to be one of the pieces people ask about. The finger leather coral tend to grow a bit more tree like than the devils hand. They will have a single stalk, often having many stalks clustered together on a single rock. At the top of the stalk rather than a clearly defined cap are branching finger like extensions. 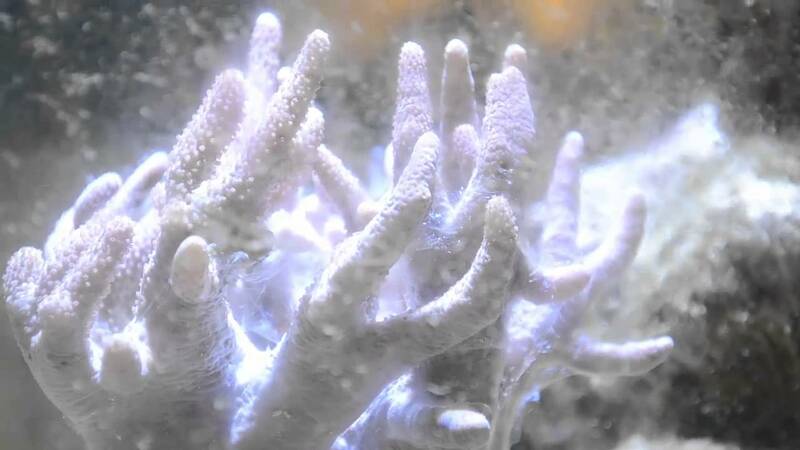 The polyps grow from the fingers. The variants that have longer and larger polyps adding to the tree like appearance in my opinion. Ultimately I think leathers are a great coral for anyone in the hobby of reef keeping. They are great for beginners because they are very resilient. 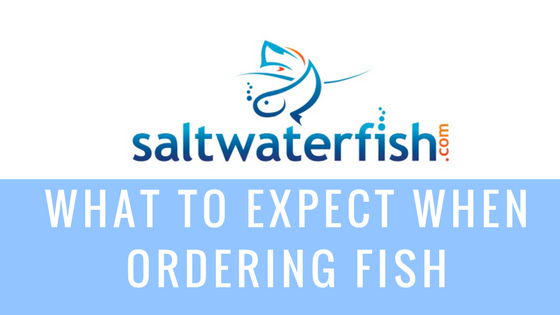 They are great for experienced reefers because they can become massive talking points in an established reef. Throw in the variety of shapes and colors they come in along with the gentle sway they get in a good water flow. These characteristics make this a great choice for anyone. 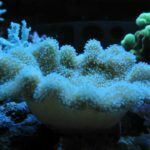 If you are new to the hobby of reef keeping and want a great plan for getting started with coral, take a look at the three phase approach we recommend. 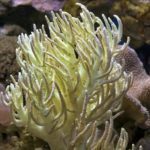 This will get you started with some easy to care for corals and as you move through the phases you will build your coral care skills along with a beautiful reef.